If you’re looking for an impressive guest book that will remain to be so for the long run, our large leather guest books are the right choice. The large guest book is a great choice for a long term sevice book for many reasons. Most obviously, our books may be personalized throughout. 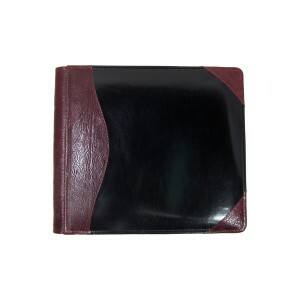 The cover leather can be inlayed with your logo, family name, or whatever you like. We don’t have font and scale limitations as are found in foil stamping, embossing, and engraving because your art is hand cut to your specifications, and glazed calf leather is stitched beneath it to create the art. Our custom guest book pages may also be personalized however you like. After gathering information regarding your purpose for the book, what information you would like to collect from your guests, and what art you would like to appear at the head of the page or in the background of the lines, our graphic designer will create a page layout for you. Upon your approval of the layout we will print your pages, and, of course, we will be happy to provide refill pages for you as needed. Our books are composed of the best materials available from the cover leather all the way to the book’s core materials. Our goal is to produce for you the highest quality product possible. Many of the best clubs, resorts, hotels, bed and breakfasts, companies, and universities use Powell Leather guest books. They may also be found in private cabins, ranches, lakehouses, ski get-aways, beach houses, and churches around the country. Please consider one of our books for whatever your need may be.